Before learning how to draw flames: some fun facts before starting sketching! The Olympic torch first appeared in 1928 when Amsterdam hosted the Olympics. The tradition of the torch relay began in 1936 when Berlin hosted the Olympics. We've already learned how to draw a fire. Then why should you learn how to draw cartoon flames? Simply because it's not quite the same. The flame is a little more simple to draw. Like you can see on the image on your left, the flame is composed of 4 different colors. White, yellow, orange and red. The bottom is even black (3)! We can also see a little spark! 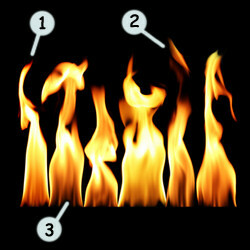 Looking at the shape of our various flames, you can notice that they are mainly drawn using lines. You won't find any pattern here. But they usually look like the one on the picture on your left. A little narrower at the bottom, then a little wider and finally, it narrows down to the top. You can add a little spark to achieve a better effect. 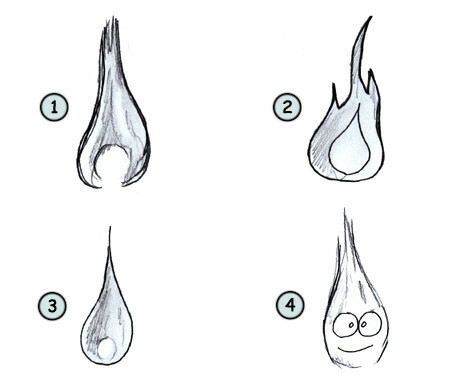 Start sketching your flame by drawing a shape similar to a drop of water. Now work on the outline to add a couple of small flames. Then, sketch another shape in the middle of your flame. It should also look like a drop of water. Next, add color to complete the effect. Drawing a simple flame is really easy (3). Most will draw their flames like we did in the example above (or number 2 here). It does look like a logo. If you have a little more imagination to spare, why not draw a flame with a face (4)? I hope you enjoy this tutorial and have fun!